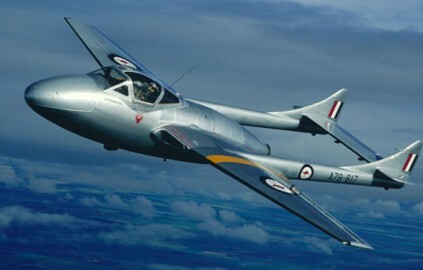 In 1953, the RAF introduced two new trainers into service, the piston-engined Percival Provost T.1, which replaced the Prentice, and the jet-powered DH Vampire T.11 which replaced the Harvard and the Meteor T.7 with the Advanced Flying Schools. The DH. 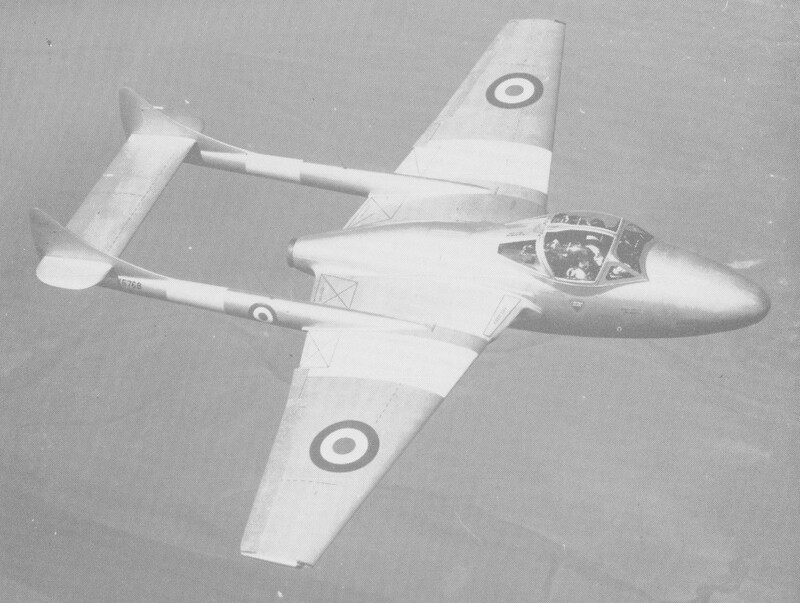 115 Vampire T.11 was based upon the earlier two-seat DH.113 Vampire night fighter variants, but deleted the radar and introduced dual controls. All the control surfaces are cable-operated through a series of pulleys, only the flaps, airbrakes and undercarriage are hydraulic—even the wheel brakes are pneumatic. One of Vampire’s features is its composite wood and metal con-struction. Between the first bulkhead and the fourth (which is just forward of the engine) the fuselage is wood and fabric. The rest of the fuselage, as well as the wings, booms and tail, is flush-riveted aluminium. The Goblin engine has a total oil loss de-sign, which means that there is no oil scavenger pump, oil filter, cooler and so on. The engine is a centrifugal-flow turbojet, about 3,000 lbs of thrust. Vampire production terminated with the Vampire T.Mk.11 and Vampire T.Mk.22 two-seat trainers for the RAF and Fleet Air Arm, 804 being completed between 1951 and 1958; this mark also achieved considerable export success. The T.55 being the export version of the RAF’s T.11. Some operated by Zimbabwe. In 1964, DH-115 Vampire T35 A79-617 was fitted with Sidewinder missile guidance equipment. Armament: two or four 20mm Hispano Cannons, two 500 or 1,000lb (227 or 454 kg) bombs or eight 60lb (27kg) rocket projectiles.